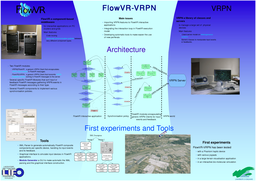 FVNano is a continuation of the previous FVNanoProto project (a FlowVR Nano Prototype, Arbez, Latapie, Nomine, Robert & Baaden 2006, 2007) and ended officially on 31 december 2011. We still use the initial FVNanoProto logo, but the framework is now well tested and beyond the prototype stage. 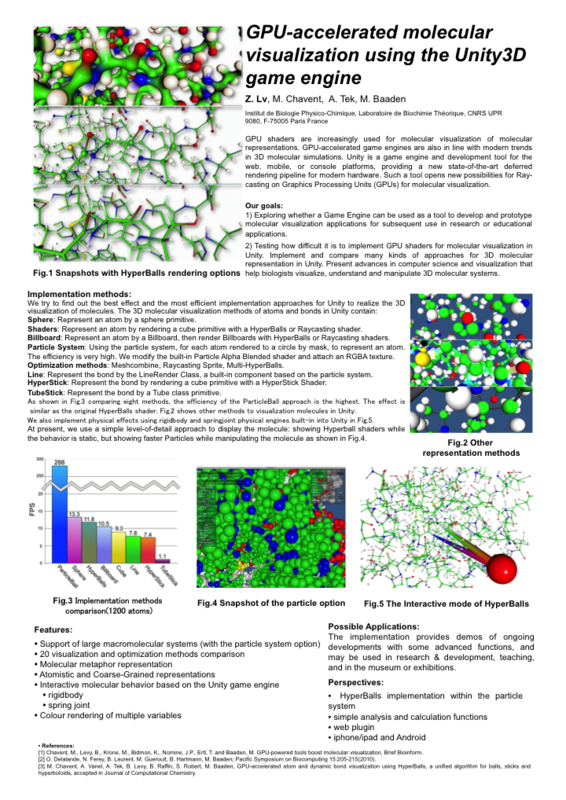 FVNano-related research will continue in the ExaViz project about exa-scalable visual analysis for life & materials sciences. Two movies are now online in the movie gallery. WiiMote integration is well under way at the LIFO. The related MDDriver tool version 0.99 is ready and version 1.0 is about to be released very soon! This is the FVNano Showroom at the LBT. There are two stereo CRT screens, two 30" LCD Displays at high resolution (2560x1600 pixel) and a large LCD screen (42 ", 1920x1080 pixel). Several 2- and 3D mice, Spaceballs, WiiMotes, JoyPads and haptic devices (Phantom Omni and Premium 1A) are used for navigating the scenes and interacting with the simulations. 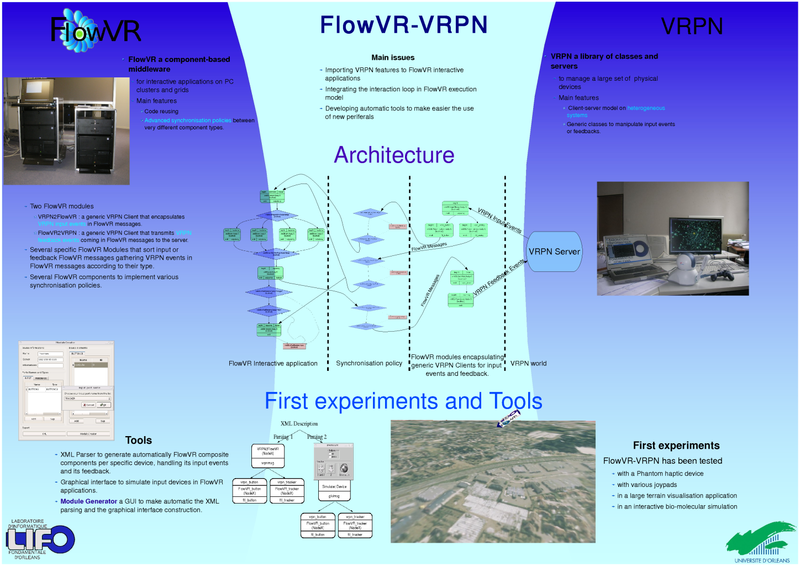 The FVNano developments are part of the FlowVR suite. A specific FVNano Wiki with development status and details is maintained. 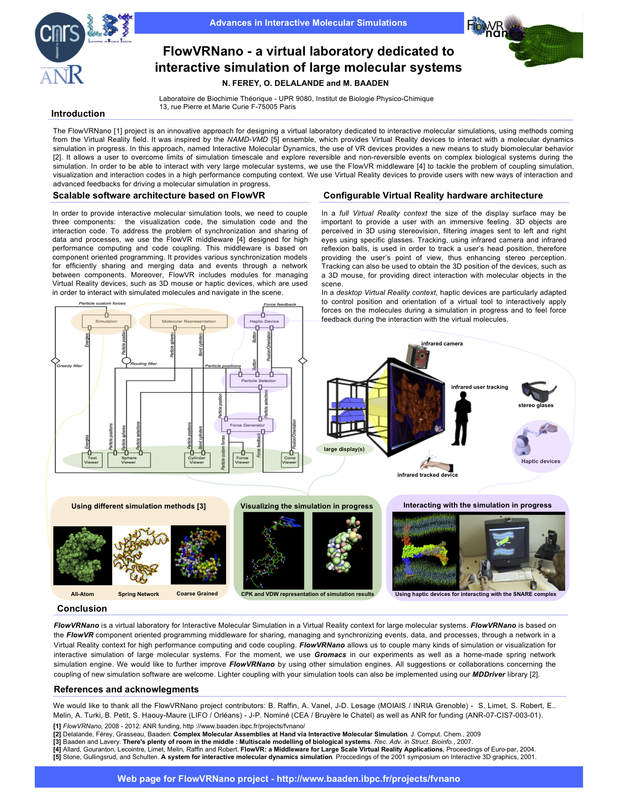 Modularity for Large Virtual Reality Applications. Jérémie Allard, Jean-Denis Lesage and Bruno Raffin. Presence: Teleoperators and Virtual Environments, 2010. MIT Press. 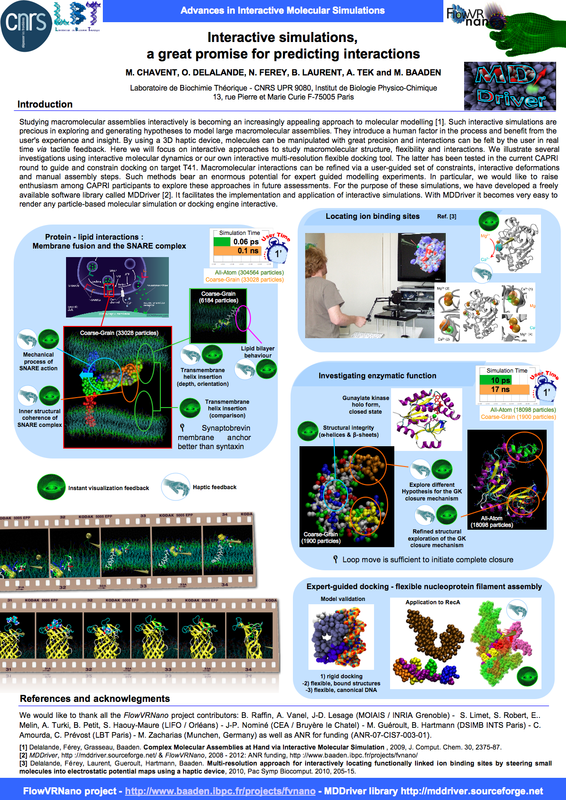 A. Saladin, C. Amourda, P. Poulain, N. Férey, M. Baaden, M. Zacharias, O. Delalande and C. Prévost : "Modeling the Early Stage of DNA Sequence Recognition within RecA Nucleoprotein Filaments", NAR, 2010, online (http://nar.oxfordjournals.org/cgi/content/full/gkq459). 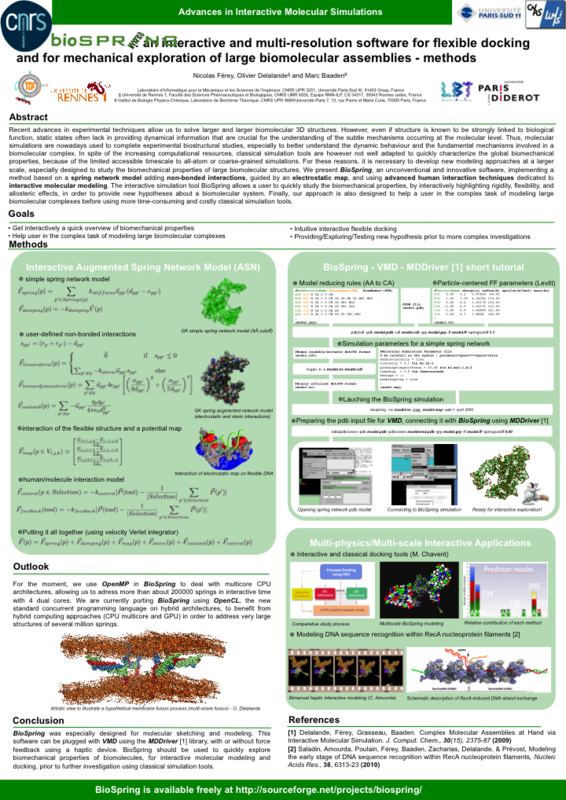 O. Delalande, N. Férey, B. Laurent, M. Guéroult, B. Hartmann and M. Baaden: "Multi-resolution and multi-physics approach for interactively locating functionally linked ion binding sites by steering small molecules into electrostatic potential maps using a haptic device", Pac. Symp. Biocomput., 2010, 205-15. 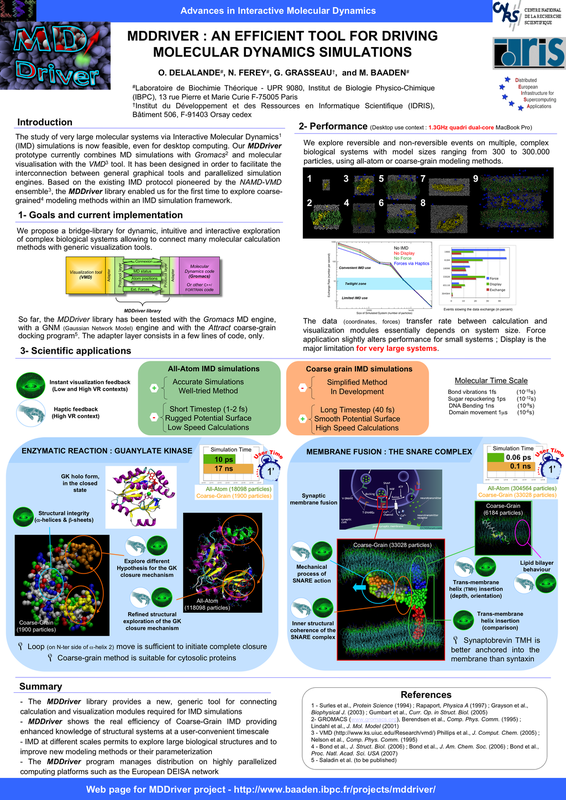 A. Tek, B. Laurent, N. Férey and M. Baaden : "Interacting with Molecular Simulations using a Multimodal VR Framework", EuroVR-EVE 2010, Orsay, France, 2010, 1-4. Jean-Denis Lesage and Bruno Raffin. A Hierarchical Component Model for Large Parallel Interactive Applications. Journal of SuperComputed. July 2008. Jean-Denis Lesage and Bruno Raffin. 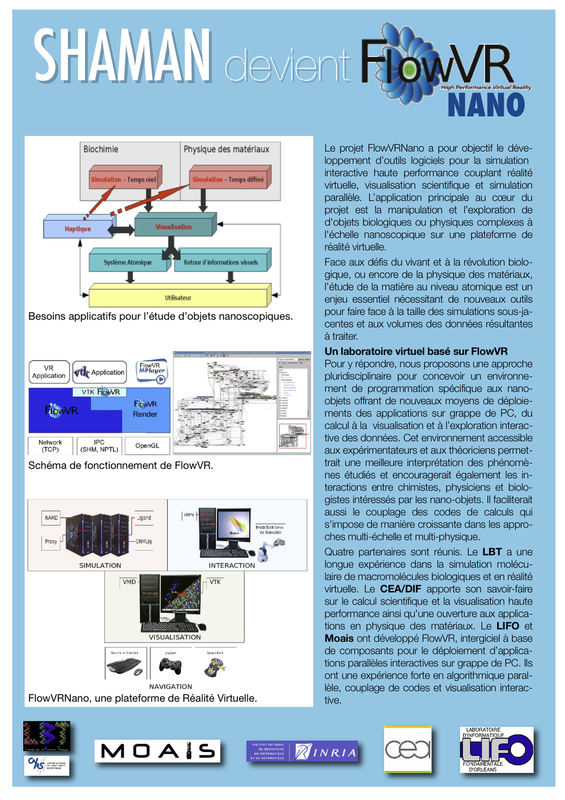 High Performance Interactive Computing with FlowVR. IEEE VR 2008 SEARIS workshop 2008, pages 3-16, Reno, USA. 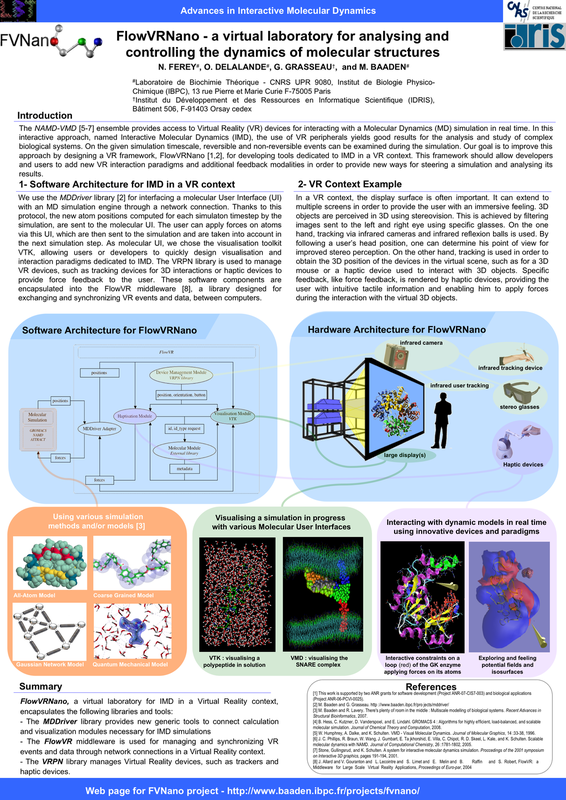 N. Férey, O. Delalande, G. Grasseau and M. Baaden : "A VR framework for interacting with molecular simulations", 2008, in Proceedings of the 2008 ACM symposium on Virtual reality software and technology, edited by E. Kruiff, pp. 91-94, ACM, Bordeaux, France. 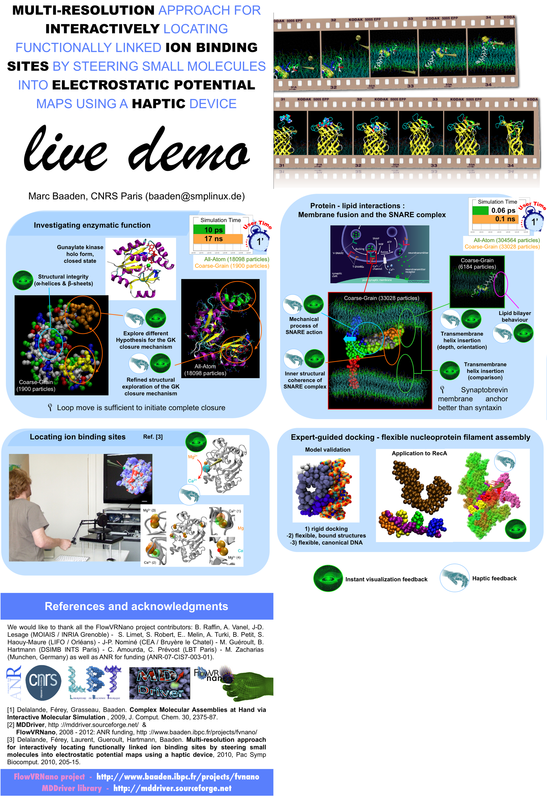 This project has been selected by the ANR funding agency in the CIS (Calcul Intensif, High performance Computing) program 2007. The FVNanoProto logo is copyright 2006 by Christophe Arbez.